The goal of the new delivery system is to get packages into customers’ hands in 30 minutes or less, the world’s largest Internet retailer said. Putting Prime Air into commercial use will take “some number of years” as Amazon develops the technology further and waits for the Federal Aviation Administration to come up with rules and regulations, the company added. Bezos told 60 Minutes that the service could be up and running in three to four years — although he noted that he is an optimist when it comes to such things. If drone delivery takes off, it could be a threat to FedEx and UPS, which Amazon uses for a lot of its deliveries now. Indeed, FedEx founder Fred Smith told Wired magazine in 2009 that the company wanted to switch their fleet to drones as soon as possible but that it had to wait for the FAA to regulate such activity. This idea, personally, is a little overwhelming. They mentioned that the Federal Aviation Administration would not clear this idea today and that Amazon would have to prove that the drones were air-worthy, but I’m interested as to what that would entail. There are some safety and maybe environmental implications that I’d like to read more about. I’d also be curious as to how frequent the drones would be and how disruptive to an average person’s day they may be. Amazon already offers one day shipping for a relatively inexpensive cost, so I wonder how much they would save by purchasing sophisticated drone technology. I’m interested to see the development of this idea in the coming years. I saw this segment during the 60 minutes episode and thought it was extremely interesting. Earlier today I saw (but didn’t really read) an article that stated that this type of technology is already being utilized in some Asian countries. The limitations to this idea are obviously the problems with the FAA that were stated earlier. I think that will be a monumental hurdle to overcome. Aside from that though, the reach of these types of services also seems to be a hurdle. The locations that offer the delivery service must presumably be close to a warehouse. This would make places like Bloomington out of reach, but also restricted air spaces such as large cities also unreachable to these drones. It seems like an interesting service, but not one that I think will take off in my lifetime (no pun intended). The concept of Amazon delivering packages via air drones can seem futuristic and maybe even a bit overwhelming. 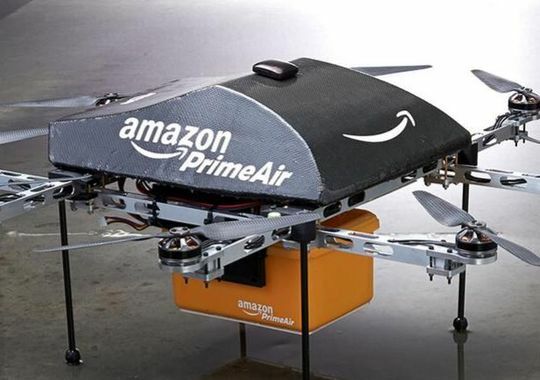 Amazon prime offers great shipping as is and I wonder if air drone delivery would even be worth the cost of implementation in the end. While air drone deliver may be fast and require no human labor, the service will be limited. Areas must be close to a designated warehouse with air drone delivery and cities may prove too cumbersome for the drones themselves. Not to mention issues that arise with the FAA and the delivering the packages themselves. All in all, the idea of air drone delivery is great to think about, but will not be a practical option for years to come. As a frequent Amazon shopper, the drones seem very skeptical to me. If these drone are going to put into action, how many drones will be used at one time. In the end of the article, a man was worried drones were going to cover the skies of Seattle. All though this may be an overreaction, there are some concerns with his comments. Let’s say all Prime users are able to use the drones, this means there are going to have to be thousands of drones located throughout the US. To me, this doesn’t seem realistic for the near future. There is also a concern dealing with the actual drones. If there are thousands of these drones flying everyday, there is a good chance drone wrecks could happen. Obviously there are many problems which need to be solved for this to be realistic in the future. I could see this in 10-15 years not 4-5 years. This is one of those technologies that seems extremely cool, but very limited in what it can do. The whole goal is to be able to deliver orders in 30 minutes or less. Which means the availability of this service from the start is only about a 10 mile radius from the warehouse. Also the drone seems to only be able to carry an small item, no larger than about 10x10x10 inches. This is a very limited market and just a cool concept that Amazon is working on to get some publicity. They say that after FAA clearances they expect to launch in 2015 but realistically I do not seeing this ever becoming a mass used service. The idea of having drones fly our packages and orders to where we are seems to bring up many different questions. What would happen if the software and hardware malfunctioned and millions of customers lost their packages in transit? What happens if someone can track a very important order for someone just to shoot it down so they can retrieve the package and use it for themselves? Also having the FAA worry about the idea of thousands of flying machines in the airspace will wreak havoc on them even more. This is quite the interesting idea for a major company to try and implement. I feel that the logistics of something this technical would be incredibly hard to get right to the point where they feel that they could regularly use drones without problems. I only have once concern about this idea. What happens when the drone malfunctions or something else goes wrong and the customer does not receive their product? That may happen too frequently for this to be an efficient method of shipping products.